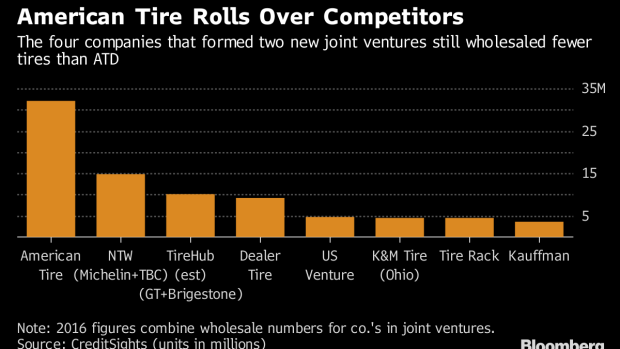 (Bloomberg) -- In a decade of disruption and bankruptcy in the U.S. auto industry, American Tire Distributors Inc. seemed to be a relative picture of calm. So reliable was revenue in the over $40 billion market for replacement tires that the company’s private equity owners confidently loaded it with debt to fund an acquisition spree that created the largest tire distributor in North America. But now manufacturers are looking to cut out their middlemen, and at least one of American Tire’s major suppliers has abandoned it. The sprawling company is suddenly struggling to repair investor confidence. With ATD’s bonds trading at less than half of face value, Moody’s Investors Service predicts it may ultimately need to restructure its $1.8 billion of debt. Goodyear Tire & Rubber Co., the third-biggest tire company in the world by revenue, announced last month that it would no longer use ATD as a distributor. The news cratered the market value of ATD’s $975 million of bonds and its $700 million term loan. S&P Global Ratings quickly cut the company’s credit grade deeper into junk and Moody’s followed suit, saying its capital structure was no longer sustainable. ATD, owned by TPG Capital and Ares Management LP, has grown from a single tire store in 1935 to 140 distribution centers and 4,000 employees. It had $5.3 billion in revenue in 2017, according to Moody’s. Despite its size and scope, however, a recent CreditSights report questions whether the company can stay solvent. "It’s a double whammy for them in less than two weeks," CreditSights senior analyst Hitin Anand said May 9 in a phone interview. "The supply risk was presented by Goodyear and the demand risk was presented by the Amazon/Sears partnership." A representative for ATD said its remaining manufacturer partners are excited to expand their relationship and that it is well-positioned online. "Given our value proposition and service capability, we continue to receive significant support from our customers who appreciate the role ATD plays in helping them drive their success," the representative said. The company also said it has strong liquidity and that it’s committed to deleveraging over time. ATD executives said on an earnings call Tuesday that Goodyear represented about 5 million out of over 40 million U.S. tire sales last year, according to people with knowledge of the call. They acknowledged the Goodyear defection would hurt earnings, though the company said in an email to Bloomberg on Wednesday that it has time to work through the exit process. ATD was founded in Lincolnton, North Carolina, during the depths of the Great Depression by J.H. Heafner, who left a career in education to go into the tire business, according to the company’s website. Heafner was inducted into the Tire Industry Association Hall of Fame in 1985 alongside Frank Seiberling, Goodyear’s founder. TPG bought ATD in 2010 in a deal valued at $1.3 billion, with Ares purchasing a stake in 2015 that resulted in equal ownership between the firms. TPG and Ares both declined to comment. The company has been growing since then, buying TriCan Tire Distributors in 2012, which expanded its operations to Canada for the first time, and Terry’s Tire Town Inc. in 2014, enlarging its footprint in New Jersey and New England. ATD almost cracked the Fortune 500, as net sales grew to $5.03 billion in the fiscal year ending January 2015 from $2.17 billion in the 2010 fiscal year, according to the Charlotte Observer. ATD enjoys a strong market position, the historic stability of replacement-tire demand, and a presence across North America, according to Moody’s. (Drivers buy new tires on average every three years, according to CreditSights.) Still, Goodyear’s April 16 announcement that it was partnering with Bridgestone Corp. to form a tire distribution joint venture called TireHub -- which followed a similar move by Michelin & Cie and Sumitomo Corp. in January -- was a major blow. The drop in ATD’s debt was so steep that it inspired a comparison with bankrupt Toys "R" Us Inc., whose bonds didn’t fall nearly as hard when the retailer announced it had liquidity issues in 2017. "With Toys ‘R’ Us, it was innocent until proven guilty," Steven Tananbaum, chief investment officer at GoldenTree Asset Management, said on Bloomberg TV on April 30. "With American Tire, it’s guilty until proven innocent." After the Goodyear news, investors held calls with independent advisers to discuss the challenges ATD faces, according to people with knowledge of the calls. On one hosted in late April by Gerson Lehrman Group, an "expert network" firm that connects businesses with professionals for a fee, the tone was positive and the consensus was that American Tire could manage the change without losing much volume, said the people, who asked not to be identified because the calls were private. On a similar call hosted on April 30 by Third Bridge, a rival expert-network firm, the takeaway was that the industry is undergoing radical change and American Tire has a difficult path forward, the people said. Investors on both calls voiced concerns that ATD could lose additional contracts. And just as Amazon’s 2017 Whole Foods purchase sent a tremor across the grocery industry, the online giant’s entry into replacement tires threatens to shake up a traditional way of doing business. The Sears partnership will start in 47 Sears Auto Centers in eight cities, eventually rolling out to more than 400 locations in the U.S.
To be sure, only 7 percent of replacement consumer tires were sold online in 2017, according to the trade publication Modern Tire Dealer. And Amazon already offered tires with the option of having the tires shipped to and installed at a service center near the buyer. "Online-tire sales growth is expected, with the rate of growth depending on how the buying patterns of millennials and the iGeneration evolve," Modern Tire Dealer editor Bob Ulrich wrote in March. However, he added, there’s a limit to the growth because tires still need to be physically installed. But ATD’s capital structure is stretched tight, said Lawrence Orlowski, a director in corporate ratings at S&P. While the company has access to $465.4 million in asset-based lending facilities and $22.7 million in cash as of the end of 2017, even that liquidity may not be enough to stay solvent if ATD permanently loses Goodyear’s business or if any other major tire makers pressure the company for concessions, according to Orlowski. "It’s important that they expand their margins so they can eventually service their debt when the time comes," Orlowski said in a phone interview. "They have to show they’re viable long-term, and that’s something we’re looking closely at." --With assistance from Kiel Porter and Kelsey Butler . To contact the reporters on this story: Josh Saul in New York at jsaul15@bloomberg.net, Eliza Ronalds-Hannon in New York at eronaldshann@bloomberg.net, Katherine Doherty in New York at kdoherty23@bloomberg.net.